Cacao is a raw, nutrient-dense food. Chocolate/Cocoa destroy the nutrients of the cacao bean with a high heat process. Good Stuff Cacao starts with just 2 ingredients; raw organic cacao and raw honey, that’s it…unless we add seeds, coconut, nibs or peppermint to make our 5 delicious, yet nutrient-dense varieties. Cross fitters Eric and Sara share their story of how Good Stuff Cacao makes them never want to cheat on their diets again. Cacao is 100% unprocessed dark chocolate. Good Stuff Cacao is raw food from the cacao bean. The Cacao Bean is one of God’s most fantastic superfoods. Why is it so good for you? First, because it’s raw. That means it’s never heated above 118 degrees, never destroying the minerals, nutrients, amino acids, antioxidants and vitamins that are naturally found in raw cacao beans. 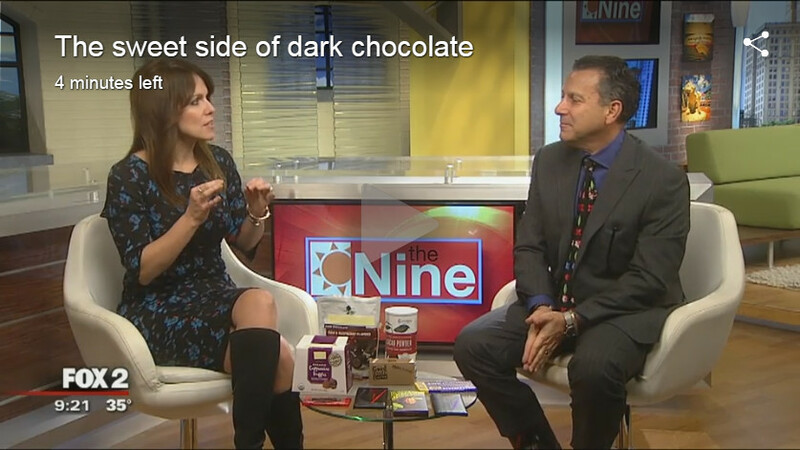 Dr. Kahn had some wonderful things to say about Good Stuff Cacao. However, the Good Stuff Cacao Founder/President wants to clear up one teeny, tiny, little point that is important to many…especially her THERE IS NO CAFFEINE IN RAW CACAO! just sayin… It’s one of the reasons she began making Good Stuff Cacao. You should check it out for yourself. Here is one site that may help. The thing is, industry standards were set (back when the English and Spaniards got it from the Mayan Indians), when they high-heat processed the cacao, destroying the Theobromine (a gentle onset, natural stimulant) and replaced it with caffeine. There is no significant amount of caffeine that occurs naturally in Cacao. Good Stuff Cacao Founder/President would be sick with headaches, stomach aches, hormones issues, and an irritable, grouch all the time if that were so–especially with how much Good Stuff she eats! With Theobromine you probably won’t feel the energy come on, as with caffeine, but all the sudden you finished that project you’ve put off, and you’re feelin’ pretty good about the whole world. Gonna go have me a piece of Good Stuff Cacao right now. Let’s get specific, minerals like magnesium, iron, chromium, anandamide, and theobromine; nutrients like manganese, zinc, copper, PEA-phenethylamine, serotonin, sulphur, potassium, calcium, phosphorus, lignin and chromiu; amino acids like arginine and tryptophan; anti-oxidants like oligomeric procynanidins, resveratrol, polyphenols, catechins, epicatechins and more antioxidants than red wine, blueberries, acai, pomegranates and gogi beans-combined; vitamins like A, C, E, B1, B2, B5 and B6. Second, because Good Stuff Cacao products never have anything extra to enhance the product. It’s not pretty. The wind, rain, and sunshine vary every day and will affect the cacao and honey. No batch will ever taste exactly the same. We don’t enhance the texture with extra processing steps or products to make it look shiny or melt less, be firmer or conform to pretty little shapes and designs, just raw ingredients. Sometimes our products will separate or may have a gritty texture. That’s okay. The same great benefits will always be there. What’s that mean? As a whole, Good Stuff Raw Cacao will aid every part and system of your body – brain, heart, skin, skeletal system, digestive system, central nervous system, muscular system, and immune system, to mention a few. Raw cacao as a superfood is an understatement. Raw cacao helps with leveling blood sugars, preventing cavities, weight loss, cholesterol, blood pressure, inflammation, moods, and emotions! Wait. Are you saying it right? The botanical name for the tree that chocolate comes from is Theobroma Cacao. The word cacao comes from the Olmec people from what is now Mexico, and is believed to be the closest pronunciation to the original name of the plant. History shows that chocolate then changed hands from the Olmec to the Mayans to the Spaniards. The word cacao is the only word ever used in any of these Hispanic languages to describe what English speakers think of as cocoa. It is widely believed that the word cocoa originates from a spelling mistake that was never corrected, perhaps because it’s easier to pronounce. Cocoa and chocolate are usually processed with heat, and are usually depleted with filler ingredients and sweetened with white sugar. Most cocoa and chocolates are so processed that there are no real health benefits. While it may taste good, that candy bar you ate gave you nothing but empty calories, bad fats that went right to the hips, will inhibit good gut activity, depleted brain health, and added to any bad cholesterol issues, heart disease or cancer issues you may have. Admittedly, great taste, but LOTS of regrets. Raw Cacao does the complete opposite.